We’ve looked at all the other couples of the Court, now we turn our attention to the final Royal Mr and Mrs: The King and Queen of Pentacles, depicted here in the DruidCraft Tarot (Philip & Stephanie Carr-Gomm and Will Worthington). As the Pentacles govern the North, Winter, Midnight, the Winter Solstice and Earth (in my system), I find these cards excellent representations of these mystical, wintery feelings. Both are dressed in green in red, but whereas the Queen is in mainly red with a green hood and cloak, the King is in green with a red cloak – nicely yin and yang. Are you rather surprised that the Queen is depicted out of doors while the King is holed up, nice and cosy in the great hall – the fire roaring away behind him with the hog on the spit? The Queen is, after all, associated with the nurturing and growth aspects of a suit – why have the King all toasty and warm? I think that the King has been depicted like this because the King of Pentacles also represents the luxury of success. This is the Druidcraft equivalent of the big corner office and if they had been invented, the King of Pentacles would have been wearing red braces and smoking a fat Havana cigar. He is Earth and Fire (Pentacles and a King) which can be VERY productive if the energies are handled correctly – too much fire and the Pentacles energy hardens and shatters. Controlled fire, as in a kiln, can create much that is useful and luxurious. The oak leaves oh his shield, by his side, tell us that he’s a wise, strong and a slow to react sort of a chap. His bare foot rests on a plinth that depicts a goat – Capricorn – although I tend to think of him as a Taurean character – what do you think? The Queen sits in a similar pose to her husband and she plays on her bodrum drum with a snow-white bone – simple and effective. It feels to me, looking at these two characters side by side, that he is more interested in high status and symbols of success (heck, even his BEARD looks fancy!) than his good lady wife, who is content to play her music outdoors to the audience of a single bemused hare. At her feet are snowdrops – the earliest herald of Spring – and the dark silhouette of a naked tree shivers behind her. Yet she doesn’t look cold. She is at home here. In her element. The Queen is Water and Earth – the creative pulse of our planet. While the King rests his feet on a Capricorn goat, the Queen’s throne is decorated with the Taurean bull. What do you think of these associations – do you have them the other way around? Both these royals are barefoot – this keeps them close to their native element, the earth, and keeps them grounded and in tune with their roots. The sky behind both seem to be at the liminal stages of either dawn or dusk. I choose to see the King at dusk and the Queen at dawn. These threshold periods are important magically and just as the King presides over the dusk and the Queen the dawn, between them they oversee our safety through the dark of the night, and also the dark of the winter. 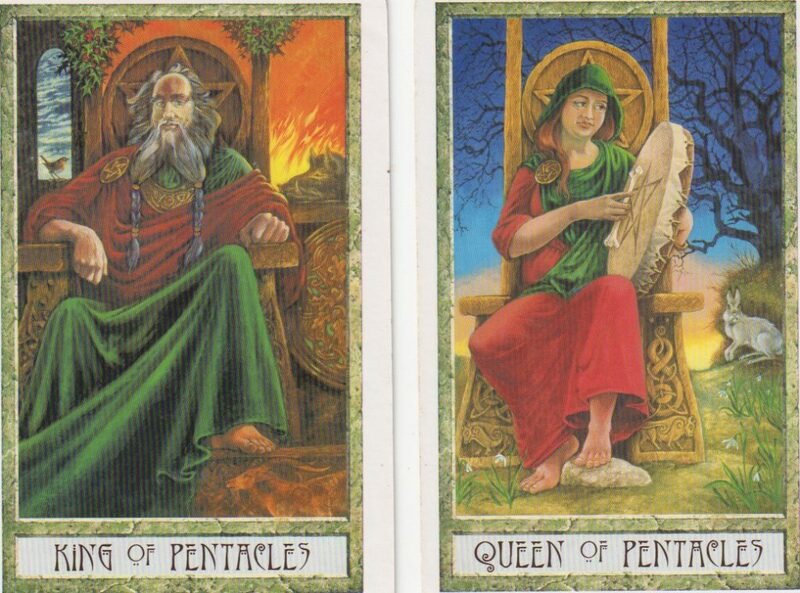 What do you think of the King and Queen of Pentacles? I never tire of the complexities and brilliant observations about court cards. It adds dimension and depth to each character! There's always something new to take a look at with these cards, isn't there? Thanks for all the info on the details, Alison. I've worked with the Druid Craft for a couple of years or so now (I think), but I had not noticed the figures on the stones beneath the King and Queen's feet. I think of Taurus as the quintessential Pentacles sign, and Capricorn, for the reasons Bonkers gives, would seem to fit in Pentacles as well. You know, I'd never thought of the indoor vs. outdoor associations in these two cards, or the yin-yang quality of their clothes – great observations/analysis. Capricorn makes sense to me for an older, more established figure like the King. You have the prudent streak, stubborn/set in ways bit, more about preserving what you have/frugality than striving/materialism of taurus, the industriousness to explain the things already achieved… at least, thats my intuitive feel? That's interesting! I do see Taureans as home-loving and Cappies as more ambitious…so yeah, that fits!!! Did not have you pinned for a Queen of Pentacles, J! How do you feel about the association – do you think it applies to you?